The SLC Punk sequel is called SLC Punk 2: Punk's Dead. But guess who's not dead anymore? Heroin Bob! Yup, despite overdosing in the 1998 cult classic, this SLC Punk anti-hero is back, and he brought the family with him. I'm officially not involved with SLC PUNK sequel. I know, I think it's weird too. But... There you go. Good luck to all involved. The Wrap reports SLC Punk writer-director James Merendino will shoot SLC Punk 2: Punk's Dead this summer in Salt Lake City. And fans of the original can get in on the action, as Merendino is allowing 2,000 fans to be extras in a major concert scene featuring headliners Screeching Weasel and the Dwarves. This sequence will be funded through Indiegogo and shot on June 20th. So keep an eye out for how to get in the crowd. SLC Punk 2: Punk's Dead will pick up 18 years after the events of the first film. 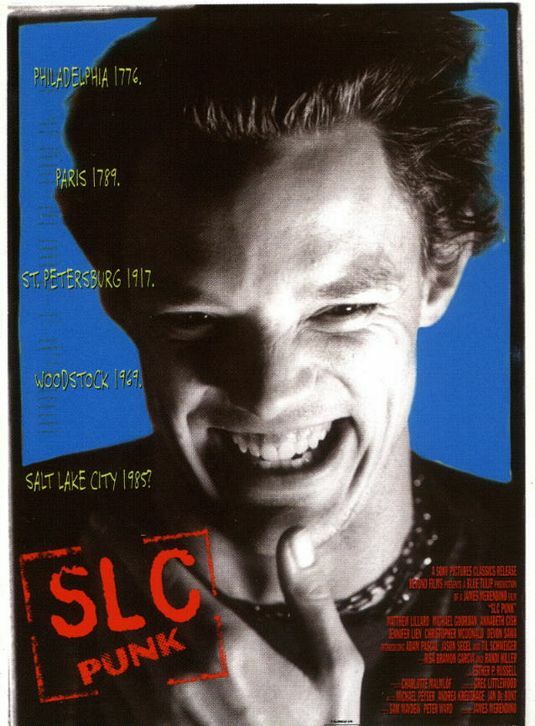 For those whose memory of the original is hazy, SLC Punk was set in 1985 and followed the antics of Salt Lake City punks Stevo (Matthew Lillard) and Heroin Bob (Michael A. Goorjian). Through wild parties, fights with their parents, and love troubles, these two stuck together…until Bob died of an accidental Percodan overdose and Stevo decides to give up punk and go to Harvard. So, SLC Punk 2: Punk's Dead will take place in 2003. In a mystifying move, Michael Goorjian is reprising his role as Heroin Bob, and at this point no explanation has been made about this major retcon. Also returning are Devon Sawa, Adam Pascal and James Duval as Sean, Eddie, and John the Mod. New to the cast are Ben Schnetzer, Sarah Clarke, Machine Gun Kelly, and Hannah Marks. Schnetzer (The Book Thief) will be playing Heroin Bob's son Ross, while Sara Clarke is rumored to be taking over the role of Bob's ladylove Trish from Annabeth Gish. Kelly will co-star as a new character called Crash, and Marks, who had a recurring role on the USA drama Necessary Roughness will take on an unnamed female lead in SLC Punk 2: Punk's Dead. But what--you might wonder--about Matthew Lillard and his character Stevo? Well, no mention of his direct involvement is made in The Wrap's report. However, there is a mention that James Merendino is promising two cameos for the sequel. At this time he's declined to hint who they might be, but we're thinking Lillard's a solid likelihood. After all, what sense would a SLC Punk sequel make without an appearance by Lillard? I mean, he was literally the original movie's poster boy. SLC Punk 2: Punk's Dead will shoot this summer with plans to hit theaters on November 21st, 2014.